The Umbrella plant is also known as the Dwarf umbrella tree. Schefflera Arboricola is the scientific name. The umbrella plant is a multi trunk tree that can grows over 15 metres tall outdoors and has to be pruned and topped at some point to keep its size manageable within a home. Its close relative () Schefflera Actinophylla) has to carefully planted because of its invasive nature and is seen as a weed in certain places. Varieties: You will find three main varieties available including variegated (Gold Capella), plain green leafed and dwarf sized trees just named schefflera and umbrella plant on sale in garden stores). They are also grown as bonsai trees. If you want to purchase a plant but your unsure of whether it's a S.arboricola or S.actinophylla and it's just named schefflera; there are some slight differences, although care conditions needed are the same - so I would suggest you buy it if you like it. How they look: They can grow with one trunk, but most likely with a two or more and multiple branches displaying palmate compound or whorled leaves (like fingers coming from the stalk) with four to twelve leaflets or more, giving it an umbrella spoke appearance. The glossy leaflets are near oval shaped and a few inches long and a couple of inches wide (depending on the age and size of the tree). Flowering: Grown in warmer climates outdoors - the umbrella plant produces bright red flowers like tentacles growing above the foliage on long stems (it's where it gets the common name octopus tree). Unfortunately were not able to get these in flower when grown indoors. Pets: The umbrella tree is mildly toxic when ingested by cats or dogs and causes them to become unwell. 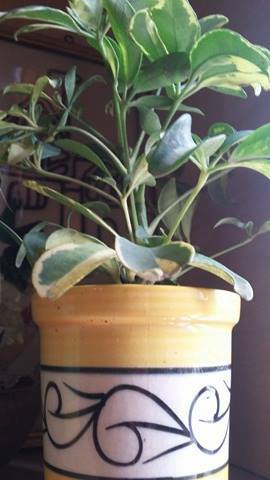 Level of care: Basic care and maintenance will keep this plant looking healthy and living a long long life indoors. It's a plant which less is more, concerning watering and feeding - too much of these will cause plant problems. When a tree matures it's likely to need to be supported with a stake or a moss stick (if it has matured enough and produces aerial roots) unless it's pruned down and pinched. A little bit too much or little of water, heat, cold or dryness won't cause any serious issues. Facts Origin: Taiwan. Names: Umbrella Plant, Queensland Umbrella Tree, Octupus Tree, Gold Capella (common). Schefflera Arboricolum, Syn. Heptapleurum Arboricolum (botanical/scientific). Max Growth (approx): Height 10ft tall or more. Poisonous for pets: Toxic to cats and dogs.Picture of umbrella treeclose up picture Plant Care Temperature: Grows well in average room temperatures between 60 - 75 °F (15 - 24°C) but no lower than 55F (13C) or higher than 75°F (24°C). Avoid sudden temperature drops and cold drafts. Light: Basic light condition of bright without direct sunlight is best suited, although lower lighting conditions only really affects it's growth rate rather than causing any harm. Watering: The best advice is to water once the top soil becomes dry. Over-watering is more of a problem than lack of water. Soil: A peat moss based potting mix with 2 parts peat moss and 1 part perlite is suggested. Re-Potting: You will need to re-pot the plant once every 2 years and provide new potting mix, during spring. To be on the safe side - hold of feeding for one month because enough nutrients should be present in the new potting mix. A good solid and heavy container is needed to prevent tall and mature trees from toppling over. Fertilizer: I would not go over the top with feeding this plant and just use a diluted fertilizer once a month from spring - fall. Humidity: Average humidity levels indoors are usually fine. If the air is dry in the room, improve humidity levels. Propagation: These are quite tricky to propagate, which is done by taking 4 - 6 inch stem cuttings, during spring. Do the usual stem cutting process and remove all leaves apart from one set and make sure a node is available which new growth will sprout from. You'll need to use rooting hormone on the cut to be placed in the soil and pot the cutting in a container that can have a plastic sheet placed over the top (usually with elastic bands holding the plastic on) or use a propagator. These need to be kept at temperatures between 65 - 75 °F (18 - 24°C and be provided with bottom heat to improve your chances of success. Make sure you do not over-water the soil, which can begin rotting the cutting and wait until you see plenty of new growth before beginning to provide basic care conditions. Pruning: The umbrella tree is a fast growing species which will need pruning back. If a tree becomes leggy or you want to encourage a bushy appearance to grow, pinch growing tips. You'll find you can pretty much cut back as much as you like with this plant and it will bring new growth back, during spring.